What Is The Prado Museum Famous For? What Are The Prado Museum Opening Hours? How Much Does The Prado Museum Cost? Is The Prado Museum Accessible? You've Visited The Prado, What Now? The Museo Nacional del Prado, also known as El Prado or the Prado, is Spain's most significant national art museum. Mentioned in the same breath as the Louvre in Paris and the Met in New York City, the Prado attracts more than 2.8 million visitors per year. The Prado is home to some of the world's most valuable and important Renaissance and Baroque masterpieces. Primarily collected by the Spanish monarchs of the 16th and 17th century, the Prado's features celebrated painters, Francisco Goya, Hieronymus Bosch, Titan, El Greco, Peter Paul Rubens, and Diego Velazquez are all represented at the peak of their talent. Arguably, the Prado's most famous painting is Diego Velazquez's Las Meninas. One of the world's top museums, the Prado is to Madrid what the Louvre is to Paris: an iconic city landmark and that merits a visit by every traveler who visits the city. A standard adult ticket for the Prado costs 15 euros. While this ticket is worth every cent, there are ways you maximize your experience while minimizing the cost. Our complete guide to the Prado Museum offers sound advice on getting the most out of the Prado, its masterpieces and the city of Madrid. The Prado was designed by Juan de Villanueva in 1785, a stunning example of 18th century Neoclassical architecture, and opened to the public in 1819. 2. To show the rest of Europe that Spanish art was equal to, if not better than, that of any other nation. On both counts, they succeeded. The Royal Collection of paintings given by the Spanish Royal Family still make up the core of the Prado's collection. Over the years, more masterpieces arrived from other Spanish institutions as well as significant bequests and donations. 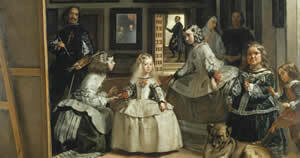 The most famous work at the Prado is Velazquez's Las Meninas. Painted in 1656, Las Meninas is one of the most enigmatic paintings of the Spanish Golden Age. Featuring a complex composition with multiple subjects and conflicting gazes, Las Meninas is to the Prado what the Mona Lisa is to the Louvre. A must-see work. A small but mighty painting, Death of the Virgin by Andrea Mantegna can be found just left of the museum entrance. This luminous piece is a good starting point for an exploration of the Prado's unsurpassed Italian Renaissance painting collection that includes Raphael, Fra Angelico and Botticelli. One of El Greco's earliest paintings, Nobleman with his Hand on his Chest was completed in Toledo, Spain around the year 1580. 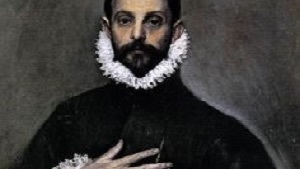 El Greco painted many similar portraits of unknown men, dressed in black outfits on black backgrounds with white ruffs creating a stark contrast. Nobleman with his Hand on his Chest is the most famous of this series. 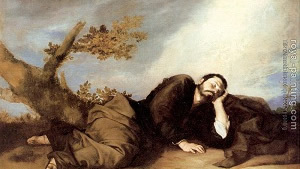 One of Ribera's best-loved paintings, Jacob's Dream tells the story of Jacob the Patriarch as depicted in Genesis. Ribera's delicate sense of color and stunning realism bring this famous Bible story to life. The Black Paintings is the name given to fourteen paintings Goya completed towards the end of his life. Dealing themes like insanity, death, and despair this collection is not for the faint of heart. The images were removed from the walls of Goya's last home, Deaf Man Villa, and attached to canvases that now sit on the walls of the Museo del Prado. For a marginally less distressing introduction to Goya, see The 3rd of May. This painting depicts the execution of Spanish patriots by Napoleon's army during the May 1808 uprising. 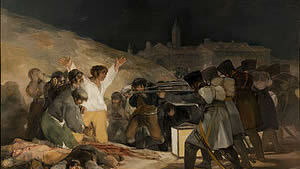 The 3rd of May is Goya's memorial to the Spanish revolutionaries who lost their lives in this struggle and is considered one of his masterpieces. 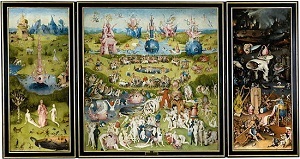 Bosch's The Garden of Earthly Delights is a three-part triptych of paintings that depict the passage from the Garden of Eden into Hell. Bosch's paintings are known for their bizarre and sometimes disturbing imagery and The Garden of Earthly Delights is no exception. 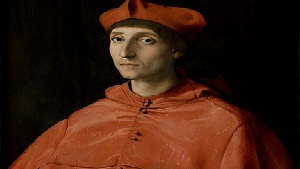 It's a testament to Raphael's skillful portraiture that his rendering of an anonymous cardinal in red has become a stand-in for all portraits of cardinals. As Bembo said, Raphael's skill lay in "painting people as more real than they are". 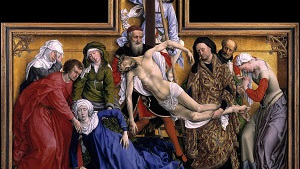 Painted for the Chapel of Our Lady Outside the Walls at Leuven, The Descent from the Cross is one of the most recognizable images of a crucified Christ. It is thought that this hyper-real painting was completed early in van der Weyden's career and helped establish his international reputation. The three graces, according to Hesoid's Theogony are Aglaia, Euphrosine and Thalia and they lived to serve the goddess, Aphrodite. Ruben's sensual rendering of the naked figures of the three graces was inspired by classical marble sculpture. 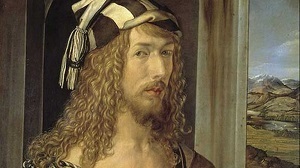 German Renaissance painter Albrecht Durer painted three self-portraits during his late twenties. This is the second, painted when he was 26 years old. Durer depicts himself as a gentleman in this painting, full of self-confidence that borders on arrogance. Also known by the title, "Artemisia", Judith at the Banquet of Holofernes is an exquisite painting of a seated woman receiving a cup from a young maid. 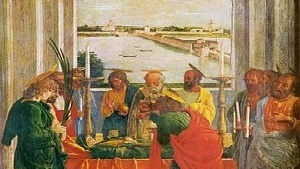 The subject of the painting was debated for centuries and historians now believe the scene portrays a story from the deuterocanonical book of Judith. 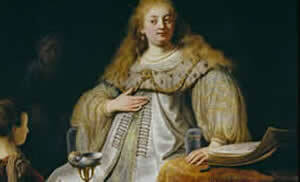 Rembrandt's wife, Saskia, is thought to have sat for the painting. Within the walls of the Prado you can find around 7,600 paintings, 8,200 drawings, 4,800 prints and around 1,000 sculptures. It's impossible to show all of these works at the same time so the Prado has around 1,300 works on permanent display. More works are unveiled for temporary exhibitions and yet more are shipped out to various museums and institutions on loan. The Prado is one of the world's greatest, largest and most visited art galleries. The museum's collections reflect the history of Spanish art and its collectors have played a key role in rediscovering emblematic Spanish painters that may have otherwise been lost to time. Chock-full of masterpieces, the Prado is well-visited and as a result can be busy with tourists. Some might suggest that you dedicate an entire day to visiting the Prado. Others would give it a full morning or afternoon. You could even try to see the Prado in 45 minutes, as the museum's deputy director for conservation and research has suggested. However you tackle the Prado, we advise you plan your trip ahead of time. It's easy to get to the Prado. By metro you can take the Red Line L2 to Banco de Espana or the Blue Line L1 to Metro Atocha. Plaza Ciebeles is a good point of reference as it is very nearby. You can also walk to the Prado from many of the major sites in the center of Madrid. From the Puerta del Sol plaza you can follow signs for the Cibeles Plaza along the Calla de Alcala. Before you even get the Prado it's a good idea to download a floor plan from the museum's website. The plan is a little overwhelming at first glance. There are four levels to the Prado with dozens of galleries. This is a very simple guide to those galleries and a recommended route. This level houses the museum's decorative arts. 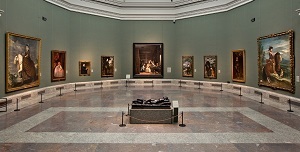 The ground level of the museum houses Spanish Painting 1100-1910, German Painting 1450-1550, Sculptures, Flemish Painting 1430-1570, and Italian Painting 1300-1600. 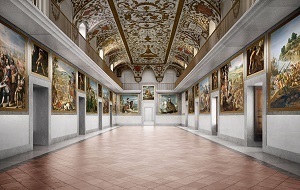 The first floor houses the bulk of the collection including German Painting 1750-1800; French Painting 1600-1800; Flemish Painting 1600-1700; Italian Painting 1450-1800; British Painting 1750-1800; Dutch Painting 1600-1695 and Temporary Exhibitions. The second floor is home to Sculptures, Spanish Painting 1700-1800, and German Painting 1750-1800. Arrive at the museum by the Puerta de los Jerónimos entrance (unless you're in a group) and head to the central hallway. From there you can meander through the ground floor's early Spanish, Italian and Flemish collections. Follow the crowds upstairs to the first floor where you can access the northern wing of the building. Here you'll find 16th and 17th C French and Italian collections. Stroll through the Spanish Golden Age collections on the first floor, spending some time with masterpieces by El Greco and Velazquez. Finish this floor with Goya before heading up to the second floor to see the Flemish and Dutch galleries where you'll see work by Rubens and Rembrandt. Return to the ground floor to see Goya's Black Paintings and finish your tour with the 19th C Spanish collection that tells the tales of Spanish history with all the grandiosity you would expect. You should absolutely buy your ticket to the Prado in advance. The tickets are timed-entry but are good for the entire day so if you want a long visit, go in the morning. Print the tickets if you can so you don't have to worry about lack of wifi or a dead battery. With your ticket in hand, you can go directly to the museum's Velazquez entrance (the central entrance in the middle of the museum's grand facade) and you're in. The Prado offers free access to the museum between 6pm and 8pm Monday to Saturday and between 5pm and 7pm on Sundays and holidays. This is a generous offer as most museums offer just one free access day per month. However, free access means lengthy lineups and even if you're one of the first people in line, you'll only get two hours with the collection. Temporary exhibitions are also not included. If you're able to take advantage of this offer and don't mind the tight schedule, go for it! Another way to save money is by buying a Paseo del Arte Ticket for €29,60. 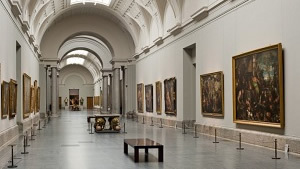 This is a great money-saver if you intend to visit Madrid's three major art museums: Museo Thyssen-Bornemisza, Museo Nacional del Prado and Museo Reina Sofía. You must redeem the ticket at whichever museum you bought the ticket from. Eg, if you bought the ticket on the Prado's website, you have to go to the Prado first to collect the ticket. Then you can use it at the other two attractions. The ticket offers a saving of 20%. Similarly, if you're spending a bit of time in Spain, it's worth buying an Annual Membership card for National Museums for €36,06. This card gets you into dozens of national museums all over Spain for free.For a full list of museums included, see here. The best time to visit the Prado is between the hours of 9am and 10am before the museum opens. However, this luxury will cost you €50,00 per ticket. The Prado is busiest between 11am and around 2pm. Tour groups don't often book slots pre 11am so arrive close to 10 for a quieter start. However, in our opinion, the best time to visit the Prado is between the hours of 3pm and 5pm. This is around the time most Spaniards break for lunch, so the crowds tend to filter out a little, leaving only non-Spaniard tourists in the building. Don't leave your visit too late in the day as once the Prado's free entry slots open up, the place is usually crammed. To visit the Prado you can buy timed-entry tickets in advance, tickets include access to the Permanent Collection and any temporary exhibitions showing on the date you visit. This is not always the case at major museums as many charge extra for temporary exhibitions. Tickets bought online or over the telephone are subject to a 0.50 processing fee. This small fee is well worth it to avoid lining up at the ticket office on arrival. Applies to citizens over 65, members of "large families" and holders of youth cards. (Reduced tickets are available for groups of 30 people or less. Educations groups from schools or universities are free). Free tickets cannot be booked ahead of time so expect a lengthy line up to get in. The Prado's audio guides are top notch but are not included in the ticket price. There are also different guides for permanent and temporary exhibitions. Children's audio guides are free with an adult ticket but are only available in Spanish and English. We recommend taking an audio guide for the permanent collection but temporary exhibitions usually include a great deal of interpretation that makes an audio guide unnecessary. The Prado also offers: Sign guides in LSE (Spanish Sign Language), adapted audio guides with hearing loop and audio guides with audio description. 1) Plan your trip to the Prado so that it fits into your plans for the day. Give yourself 2-3 hours to see the museum and consider how long it takes to get to the museum from wherever you are. Be sure to time meals, especially if traveling with children, and take a coffee break in the middle to break up the experience. 2) Use the Prado information centers. Friendly and helpful staff are on hand to answer any questions you have, direct you to facilities and hand over a useful floor map (available in several languages). 3) Use the lockers. The Prado offers a free locker and cloakroom service and we advise you use it. Carrying a heavy bag or coat becomes tiring very quickly. The only things that can't be left in lockers are any bags too big to pass through the security scanner, food and drink, anything dangerous and, strangely, any art materials. 4) Use the wifi. Log on to the Wifi as soon as you arrive at the Prado to stay in touch with the rest of your party. You can also use online resources to help you find your way around. Downloading the Prado map to your phone saves paper and you can use the internet to research any artwork you find particularly interesting. 5) Get the guidebook. The Prado guidebook is an extra €9 but will enrich your experience. The guidebook is full of images of the artwork on display and makes a great souvenir or gift for an art-lover back home who couldn't make the trip. 6) Think about taking a tour. The Prado offers tours of different lengths that focus on a variety of subjects. For prices and itineraries, see the Prado website. 7) Visit the Prado cafe, shop, and bookstore. The Prado cafe is a great place to stop for refreshments during your visit. The Prado shop features official merchandise including postcards, posters, and souvenirs inspired by the collection. 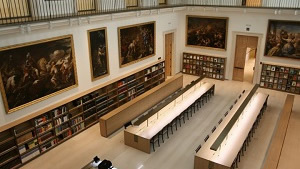 In the Prado bookstore, you will find the Museo del Prado's publications, some of which may be difficult to find anywhere else. Yes. The Prado museum has undergone major renovations in recent years and has greatly improved its accessibility. Tours around the museum can be adapted to suit people with physical impairments. Accessible toilets are available and there are wheelchairs and walking sticks available for loan. For those with vision or hearing impairment, there are audio guides and sign guides available. The museum's auditorium features a hearing loop. Areas connected to the Villanueva building in the Prado are currently not accessible. Design features of this building make it difficult to adapt but the Prado states that it is looking for a solution. Here are a few final things you may not know about the Prado. Music to some visitor's ears and alarm bells to others, you may be surprised to learn there is no photography permitted inside the Prado. No selfie sticks swinging in the air, no video chats with family, no huge DSLR cameras blocking your view. Our advice? Lock everything away in a locker and embrace the experience camera-free. You cannot take a bag larger than 40 x40 cm into the museum. If you have a large bag because you're traveling that day or are visiting with children transfer your must-have items to a smaller bag and lock your large bag away. Cafe Prado is the only place you can eat or drink in the entire museum. If you don't like the prices (which are fairly reasonable for a museum cafe) or don't want to stop mid-visit, make sure you're fed and watered before you arrive. Many people choose to carry their babies in carriers on their chest or back these days as it's more convenient than pushing a pushchair. Unfortunately, these sorts of carriers are not permitted in the Prado. To bring a baby or small child who cannot walk independently into the museum, they must be in a stroller. You can swap your stroller for a carrier for free at the museum entrance. In 2009, 14 masterpieces from the Prado collection were added to Google Earth. The images can be viewed in mega-high resolution which means they reveal details that cannot be seen by the naked eye. Spend some time with these images before or after your visit to add another dimension to your appreciation of the work. See a list of images included here. The Prado is located on the Paseo del Prado, one of Madrid's most iconic streets. These are a few other attractions in the neighborhood. The collection in this museum is completely different to that of the Prado. Privately-owned, the Museo Thyssen-Boremsza has paintings from the likes of Van Gogh, Edward Hopper and Monet as well as an interesting calendar of temporary exhibitions. The Museo Reina Sofia is one of the three museums included in the Arte de Paseo ticket. Full of world-class modern art, the Reina Sofia is home to one of Picasso's most famous works, La Guernica. Madrid's botanical gardens are located behind the Prado. Although most beautiful in the spring, the gardens are the perfect spot for a picnic and a stroll all year round. To take in some of Madrid's Roman Catholic culture, visit the Basilica of Jesus of Medinaceli. This particular basilicia is home to an important sculpture of the building's namesake. While you're in the Prado neighborhood, don't miss a visit to El Retiro Park. This expansive 19th century park and gardens is home to numerous fountains and statues, a boating lake and a glasshouse that dates back to 1887. Madrid is a huge, vibrant city with no end of attractions to visit and things to do. It's easy to find free things to do in Madrid and unlike some other European cities, Madrid really comes to life when the sun comes down and there're always things to do at night in Madrid. Tickets for many of Madrid's attractions can be purchased online, either at the attraction's website or through third-party sellers. Most third-party sellers of Madrid attraction tickets are essentially travel agents offering a legitimate service. But, as always, be careful when buying anything online. A Madrid Pass is a great option for those intending to do some serious sightseeing. There are five different passes available offering various perks. Do your research to figure out which one is best for you. Getting around the city is easy with the Madrid Hop on Hop off bus. If you want to take the hassle out of planning your trip to Madrid you can also opt for a Madrid Day Trip. These trips generally cost less than if you visit each of the attractions individually and also include transportation so you don't need to worry if your Spanish is a little rusty. No visit to Madrid is complete without a visit to the Prado Museum. The best ticket option for you depends on how much time you intend to spend there, your budget and your plans for the rest of your trip. If money is no object and you have time on your hands, buy an early-bird ticket to see the Prado before it opens to the public. If you want to see all three of the top national art museums go for the Arte del Paseo ticket, but bear in mind you can't book a time slot that allows you to skip the line. If you want to save cash, line up for a free ticket later in the day. We hope this guide has helped you to prepare for what is sure to be an inspiring visit to the Prado! Duration: All Day – Approximately 11 hours total. Duration: Day-ticket –2-3hours is recommended as a bare minimum. Duration: 1 or 2 day tickets are available. If you stay on the bus to do the loop without departing, the Blue Line tour takes 80 minutes and the Green Line tour takes 65 minutes. Duration: Half Day – 5 Hours.